Located in Gravesend, this apartment is convenient to Pocahontas Statue and Gravesend Town Pier. With a stay at Ivydene in Eastbourne (Eastbourne Seafront), you'll be minutes from Redoubt Fortress and Military Museum and Treasure Island. With a stay at Arendale Hotel in Blackpool (North Shore), you'll be within a 15-minute drive of Blackpool Pleasure Beach and Blackpool Beach. With a stay at Wolfscastle Country Hotel in Haverfordwest, you'll be 8.6 mi (13.9 km) from Fishguard Port and 9.5 mi (15.2 km) from Newgale Beach. Free self parking is available onsite. Located in Inverness, Westview House is in the historical district, a 4-minute drive from Culloden Battlefield and 8 minutes from Clava Cairns. Self parking (subject to charges) is available onsite. With a stay at Meadow Cottage in Salisbury, you'll be within a 15-minute drive of Old Sarum and Salisbury Cathedral. Free self parking is available onsite. 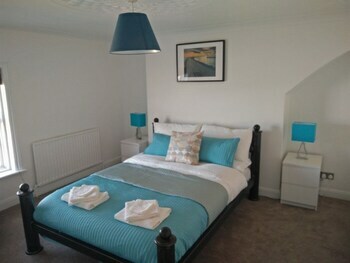 When you stay at Merwerydd Guest Accommodation in Aberaeron, you'll be 8 minutes by car from Llanerchaeron. Free self parking is available onsite. With a stay at Relaxinnz The Highwayman Inn in Shepton Mallet, you'll be within a 15-minute drive of Wells Cathedral and Kilver Court. Free self parking is available onsite. Located in Andover, The White Horse is a 4-minute drive from Thruxton Motorsport Centre and 5 minutes from Museum of Army Chaplaincy.